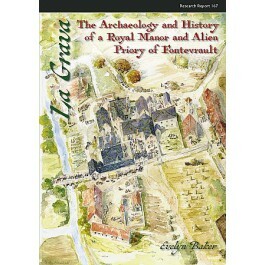 The site of La Grava (or Grove Priory) in Bedfordshire, excavated in advance of quarrying between 1973 and 1985, was one of the most extensive monastic/manorial projects of the 20th century in the UK. Excavated originally as a medieval religious house, identified as an alien priory of the Order of Fontevrault in Anjou, the site was to reveal settlement from the Romano-British period to the 16th century. Granted to the Order of Fontevrault in 1164, the priory became the home of the Procurator of the Order in England. From the later 14th century the site reverted to a lay establishment and was held by high-ranking royal women. The excavations were notable for several reasons, including their extent, the stratification in the remains, and the continuity of settlement from the late Saxon period onwards. Post-excavation analysis and reconstruction of building plans has led the author to suggest detailed sequences of spatial planning across the site. The royal and ecclesiastic connections to the site provided excellent documentary sources, enabling recorded events to be linked to building works. When combined with the large finds assemblage, and detailed reconstruction drawings, a vivid picture of life at La Grava over several centuries can be painted.